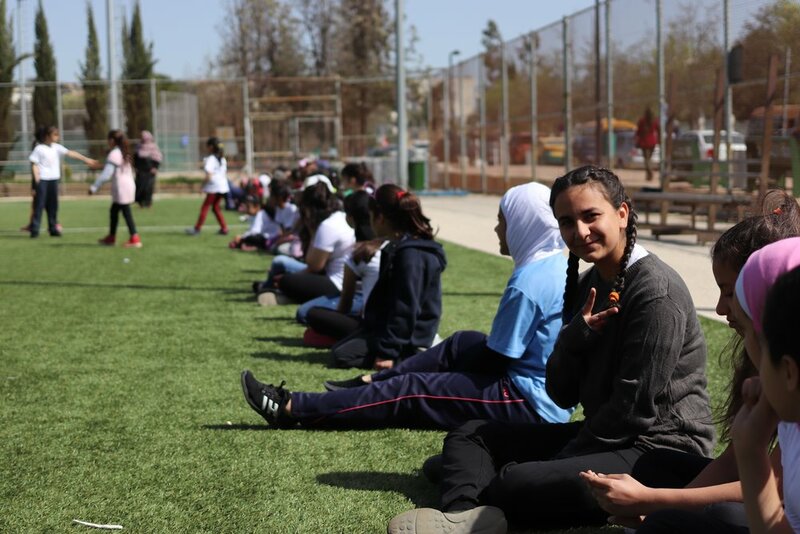 It was a beautiful, sunny day in Amman at Al Hussein Public Park for our third session of camp. Volunteers arrived at 9:30 am to set up in anticipation of welcoming large a contingent of girls from Reclaim Childhood and Sawiyan as well as a growing group of individual campers from across town. As a succession of yellow buses arrived at 10 am, a wave of eager and excited girls ran onto the field. The bonds formed between the girls was evident as they hugged and greeted the friends they have made over the past weeks! 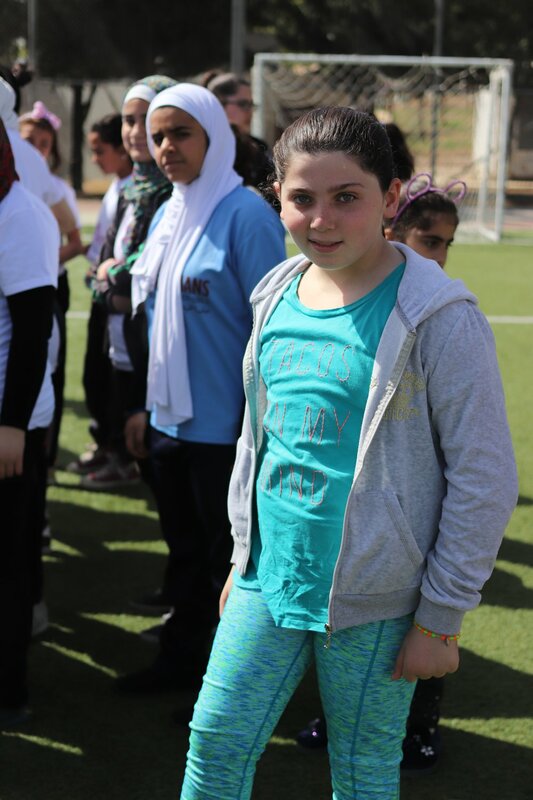 Coach Rawda assembled the girls along the white line of the soccer field, welcoming them back and reminding them of the running camp’s goals. After Coach Rawda kicked off camp, volunteers Abdullah and Abdelqayom Albasha let the girls in a series of stretches and speed drills. While Abdullah and Abdelqayom had hoped to compete in the Boston Marathon this upcoming Monday, unfortunately their visa is still under review. Instead, they donated their time today supporting camp. 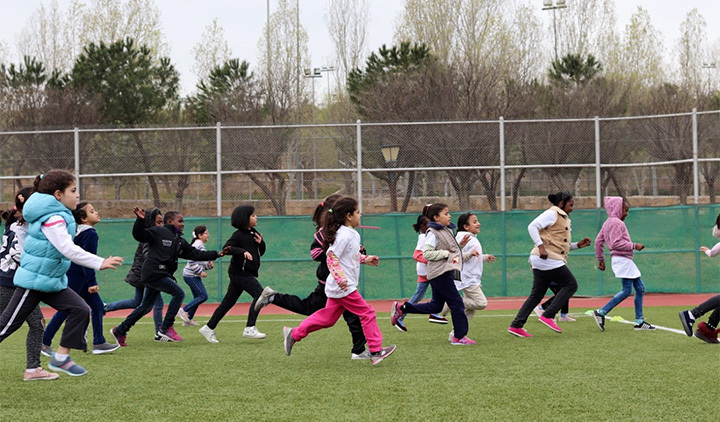 The first activity was a running warmup where girls had to run from one cone to the other along the soccer field. The older girls were assigned as leaders, and they each led their younger peers and encouraged their team members to do their best. After two rounds, the girls started to run farther as volunteers offered high fives to them after each successful lap along the way. Then the girls cooled down with a set of stretches and a water break. Before lunch, Coach Rwanda gathered all the girls in a circle, told them to place their right hand in and chant: Nina, Nina, Nina! On their lunch break, the girls sat under the shade eating their delicious Shawarma and choice of fruit. The volunteers began to lay out the journals and, after eating, each camper was invited to take their book back to the soccer field. Today's main journal question was: what makes a good team player? Before writing their own answers the girls shared their thoughts in a group, mentioning respect, helping those who fall behind, and caring for each other as important aspects of teamwork. After discussing as a group, each student was given five minutes to reflect on their own and record their answers. After each student provided three important aspects of teamwork, volunteers collected the journals and prepared them to meet our amazing guest speaker for the day: Lamis AlZaim, a trainer at SheFighter Amman, the leading self-defense school for women in the Middle East. Started by Lina Khalifeh, SheFighter is a renowned organization that has been featured on AJ+ for its mission to advocate for women’s rights through martial arts. It is the first self-defense training center in Jordan. We were honored to have Lamis lead a workshop with the girls to share this mission and encourage them to be powerful. First, Lamis gathered the girls in a semi-circle and discussed the importance of self-defense as a tool for empowerment. The girls sat in awe as they listened to and watched Lamis demonstrate the core moves of self-defense. For each demonstration, the girls raised their hands to volunteer and participate in the demonstration, with sincere anticipation to practice themselves. Finally, the girls partnered up and practiced the moves they had just learned. After a long day filled with activities, the girls gathered their bags to leave and get on the buses. The volunteers cleaned up and debriefed their thoughts on how the camp went. Overall, another great day in Amman! 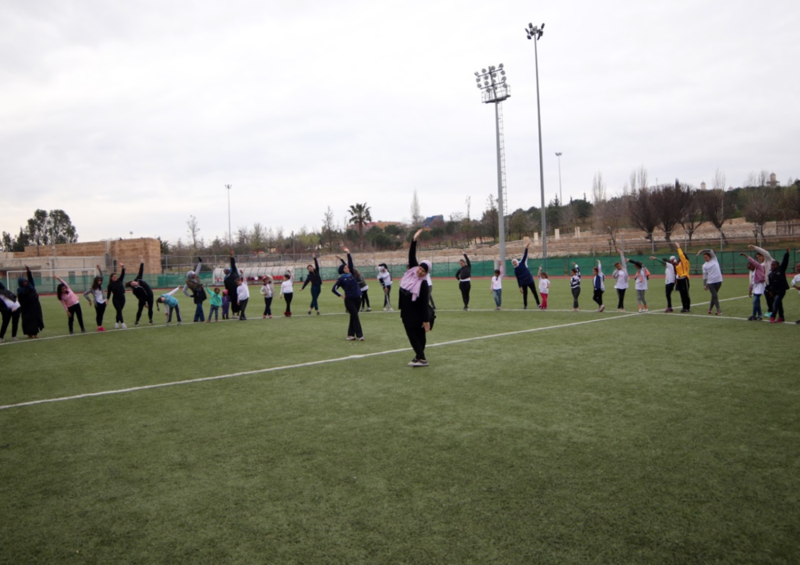 Over seventy girls from across Amman brought their enthusiasm and incredible energy to King Hussein Park this morning. While the weather was still a bit grey, spirits remained high from the outset, as a group of girls started an impromptu dance warmup on the bus ride over. With the weather a bit chilly, most girls and coaches wore sweaters over their T-Shirts, but the game play heated up throughout the three-hour event. Now that the girls have been introduced to the camp structure, the pace of play and enthusiasm has only increased. Head Coach Ru’a started the morning with an introduction, review of the rules covered last week--namely respect, kindness, and commitment to peer sport--and a rapidfire jumping jacks spree that got the girls excited to participate in camp. Ru’a then tested the girl’s knowledge of the classic Nina Brekelmans camp chant to get everyone fired up for the day. Afterwards, Ru’a split the team into three activity sections based on age. Coach Hanan ran some activities with the younger girls and coached a particularly cute hugging game, where the girls raced around each other until a shout from Hanan signaled that the girls must hug someone nearby. Many of the girls just piled up and hugged each other (this got some “awwww”s from volunteers). Ru’a led a section of older girls, many of whom have a background in sports. Towards the end of the drill, Ru’a switch roles and invited some eager girls to lead their own activity sub-sections. They were excited to take on the responsibility and led their peers in dance circles and hype songs in addition to sports activities. This was a great chance for the younger girls to see examples of how they may one day lead camp activities on their own. Our volunteers were an especially energetic bunch this week. One volunteer, Kendall, spent time cartwheeling around camp and teaching some of the more shy girls along the sidelines how to do headstands. One little girl insisted that our volunteer Rosalie roll around with her on the ground. Rosalie obliged. Yet another volunteer, Jodi, allowed the girls to test out different hairstyles and headbands on her during a long water break. We’re thankful for the steadfast commitment of our volunteers and coaches! Just as the girls finished running, our guest speakers for the day, Shareefa Alsqqa and Ashwak ßåÐråñ, arrived and led the girls in a cool-down stretch. 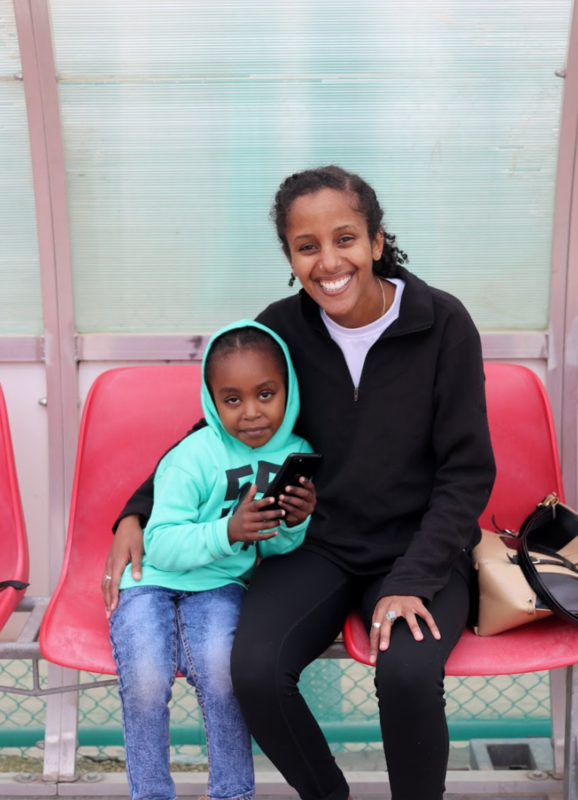 Shareefa and Ashwak are both elite competitive distance runners and were close friends of Nina’s during her time in Amman. We were honored to welcome them to camp this week. Shareef and Ashwak explained the importance of running form and how one must always stretch after completing a long run in order to gain strength. After inspiring the girls, everyone took a lunch break of shawarma, banana and apples while Shareefa and Ashwak shared more of Nina’s story. They described what an excellent and motivated runner Nina was, and how she was able to win nearly every race she entered in Jordan, due in large part to her work ethic but also because of her kindness to others and determination. Inspired by Nina’s story, the girls, volunteers and speakers all took a group photo in the first of many Nina Camp group photos this year to commemorate the day. Following the lecture, the girls closed out the afternoon with some journaling time. It is evident that bonds are already forming between the campers and volunteers. During the journaling period, two girls shared that they had written about how much fun they had learning from one of our star volunteers, Sophia. Other girls drew themselves holding hands with their fellow campers, volunteers and coaches. As the girls high fived the volunteers on the way to their busses home at the end of the day, their enthusiasm for the next camp week--and for race day--left the cloudy afternoon feeling a little brighter. 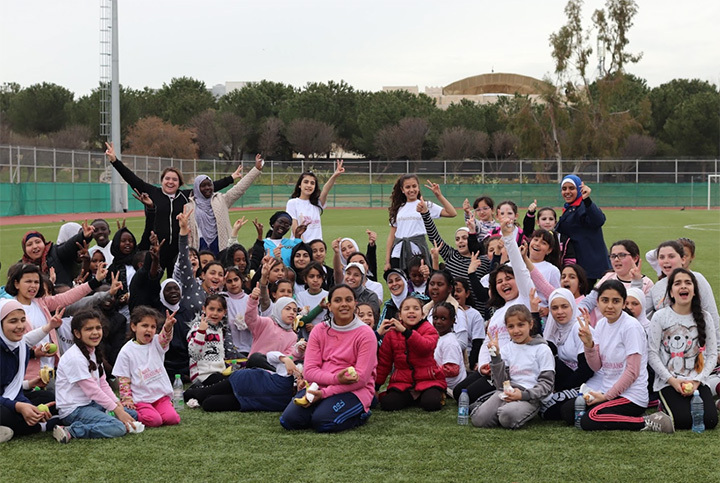 While grey skies and a storm were predicted for the first day of camp, the campers and coaches relocated our kickoff day for the 2019 Nina Brekelmans Running Camp for Girls from our outdoor location at King Hussein Park to the beautiful, spacious gym of Tala’a al-Ali Girls High School. 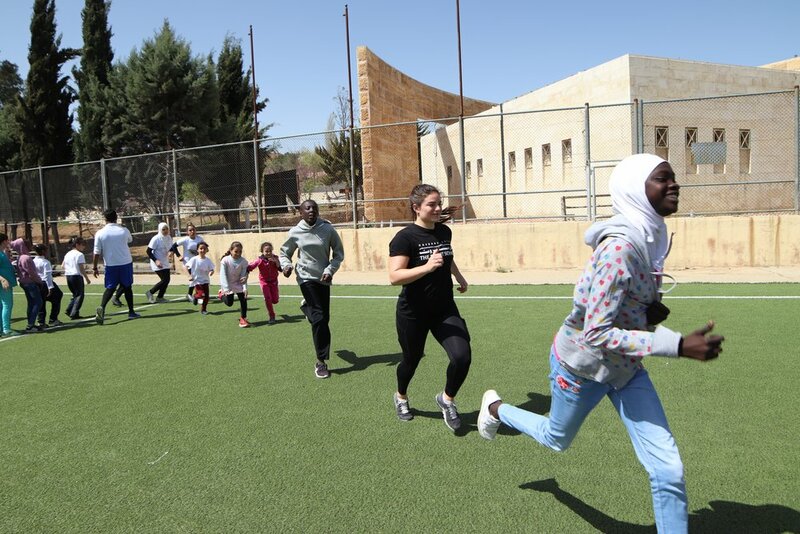 When the start time changed to 9am instead of 10am to accommodate the new space, 56 girls from around Amman were up early to hop on three busses and gather at the gym to learn, run, and be inspired by Nina’s story. Twelve fantastic volunteers supported the camp today as well! One star volunteer Georgie was up earlier than the rest, facilitating the bus for our new partner organization, Sawiyan, riding the bus to pick up girls from Jebal al-Akdar, Jebal al-Jofah, and Jebal Amman in addition to our participants through Reclaim Childhood. When all girls arrived, each were given custom-made t-shirts that they will wear for each day of the camp throughout the next month. Our head coach gave an inspiring speech about the values of camp to start the day. What are they? Honesty, kindness, determination, and, first and foremost, respect for one another. No one succeeds alone; every success that we achieve at the running camp is done as a team. Our head coach joined with Jordan Director, Sophie, to talk about how the Nina Brekelmans Memorial Foundation works in Washington, D.C. and Jordan and shared Nina’s story to inspire the girls. Nina was always kind to her friends and family. She focused on her education, dedicated herself to running, and was a good friend to all. The girls promised to support each other in honor of her memory. The discussion ended with our favorite chant of Nina’s name and a promise to work together to succeed at the 2019 Nina Brekelmans Race for Girls. After we reviewed the rules of the camp, the girls were split up into four groups of approximately 15 for three rounds of activities led by our two head coaches and two assistant coaches. There was a tag-and-chase game, a game of throwing and catching cones and balls, and a sprinting challenge game. The girls loved the games as the gym echoed with the excited sounds of their screaming, sneakers squeaking, and laughter. Once the girls finished the activities (and a water break! ), they all gathered for a seven-minute group run to practice for the race. Each learned about breathing techniques and establishing their own pace. They focused on pushing themselves and respecting each other’s space. When they were sufficiently tired out, they all headed into the classroom attached to the gym for some quiet time. When seated, the girls were each given a new journal and pen. They wrote their names on the front and wrote about what words they associated with Nina and the 2019 race: winning, strength, kindness, friendship, prize, completion. They then each drew themselves crossing the finish line. Many also drew photos of Nina! After quiet time, the girls enjoyed shwarma, cheese sandwiches, apples, bananas, and water while listening to the wise words of our honored guest, Lina El Kurd, the General Manager of Run Jordan, Jordan’s largest and most successful running association. Lina inspired the girls with stories of how she became Run Jordan’s general manager and discussed the organization’s programming and design. She encouraged the girls to take on leadership roles in their community and ended with a huge round of applause. We are so grateful for her time. Many of the girls expressed how excited they were to meet her! After camp, the girls scattered off to their busses, high-fiving the coaches and volunteers on the way out! We can’t wait for next week. The 2019 Nina Brekelmans Running Camp Kick-Off! We hope you are well, and wanted to let you know that we’ve been busy gearing up for our fourth year. We are excited to share with you the official dates for this year’s Nina Brekelmans Running Camp for Girls and Nina Brekelmans Race for Girls in Amman, Jordan! The camp will be held four consecutive Saturdays - March 30, April 6, April 13 and April 20 - at Al Hussein Public Parks. The culminating event - a 1k race - will be held the following weekend, April 27, at the same location. 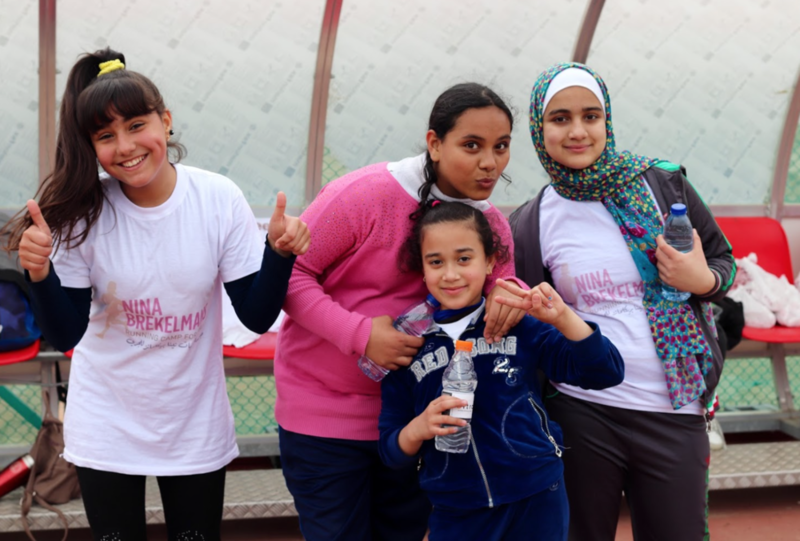 Thank you for helping the camp grow and thrive as we work together to advance Nina's vision to promote self-confidence, leadership, and well-being among young women in Jordan through running. Last year, the camp welcomed 30 to 40 girls each week with lessons on running, role models, sportsmanship, strength training and nutrition. Nearly 70 girls ages 8 to 14 participated in the race. And we welcomed two amazing new head coaches - Rawda Hamadneh and Ru’a Al-Abweh - who will join us again in 2019. We’re lucky to continue having fantastic on-the-ground support from the U.S. Fulbright program. Sophie Zinser, who helped guide the camp last year, was appointed our first in-country Director of Operations and will lead our Fulbright volunteers this year to help to ensure we provide our campers with a phenomenal experience. Promoting leadership will continue to be an important theme for us in 2019, as we invite back past campers to serve in mentoring roles. We’ll also strive to strengthen partnerships with local organizations. Reclaim Childhood, a tremendous partner, is working hand-in-hand with us for the third year. With your support, and with our Jordanian friends and partners, we’re really looking forward to making the 2019 camp and race the best yet. Follow along on our website, blog, and social media channels - including Facebook and our new Instagram account (@ninab_camp) - to learn more about this year’s camp (and the people behind it) in the weeks and days leading up to our camp kickoff. We’ll be sure to post blog recaps of each camp day as well, and you can also sign up here for our mailing list. Camp participants can register here. If you would like to volunteer for the camp, you can register here. And if you’d like to contribute to our success in 2019 and beyond, please consider donating. We really appreciate the support we get. Small donations make a big difference! The Nina Brekelmans Memorial Foundation is a 501(c)3 non-profit based in Washington, DC, and all donations are tax-deductible. We excitedly began this week of camp with the early arrival of many of the girls a half hour before schedule, at 9:30 instead of 10am, to which our coaches eagerly lead the group in a round of duck-duck goose, group stretches, and circle icebreaker games. Once all of the girls had arrived at 10am, our coach Rawda lined the girls up on the corner of a field. Five new girls had joined the camp from a small local organization in Zarq’a, and we welcomed them into the larger group. Rawda told them about the history of the camp and about who Nina was, and reminded all of the girls about how the camp began. After sharing Nina’s inspiring story, Rawda told the girls that they were smart, powerful, and shouted “What are we” and the girls replied “strong!” as loudly as they could. After the rousing discussion, Rawda lead the girls into 3 groups. Each group had a set of sprint exercises that they completed as a warm up using half of the soccer field. While two groups were sprinting, another two groups were sitting down and cheering on their peers. The groups were divided between the older and younger girls so that each was placed in an appropriate level with their peers. After this set of sprints, the girls were split into two larger groups and raced each other for full-field races, while other girls cheered them on. At the end of this exercise, all of the volunteers raced each other, while the girls cheered for each of us (especially “Rawda” and “Ms. Nicole”). After this, the girls practiced a distance warmup where they were split into 8 small groups, and ran between cones spread out across the field. If one girl got tired, they could take a rest at the cone, and the team would run back and retrieve the camper before the coach blew her whistle. By the time they returned back to the soccer field, it was really pouring rain. Luckily, the Fulbright team had prepared tents with little chairs for them to sit in. The girls were able to stay dry and eat their fill of delicious shawarma, apples, and bananas. The girls happily ate and took a break before they moved to the northern building at Hussein Park where they sat in a classroom for their lecture by Coach Rawda. Nicole Khamis is part of this year's leadership team and teaching English in Amman, Jordan as a 2017-2018 Fulbright Scholar. The first time that my Jordan Fulbright cohort and I heard Nina Brekelman’s story was almost a year ago when we gathered together for the first time in Washington, D.C. The Fulbright Program is an international exchange opportunity for study and research that works to foster intercultural exchange and mutual understanding through different cultures. A key way that Fulbright achieves this is by sending individuals abroad who are passionate about doing this exact thing- and Nina was no exception. Her passing came shortly before she embarked on a Fulbright Fellowship in Jordan to research the experience of female distance runners. Nina’s legacy is inherent in the dream of William J. Fulbright, who established the Fulbright Scholarship after World War II to bring a divided world together. Her passion for learning about other cultures, engaging deeply with local communities in Mexico, Egypt, and Jordan, and her love for empowering marginalized communities, shined through in everything she did. Nina’s love for running, Arabic, and her infectious smile are still remembered by the many she worked with and impacted here in Jordan - and we are committed to continuing her legacy here in Amman by organizing the third annual camp and race for girls founded in Nina’s honor. The running camp, which will begin Saturday, will once again provide instruction on running training and techniques to young girls ages 8 to 14 to promote healthy living and self confidence. The experience will culminate May 5 at Sports City with a race in which the girls can show what they learned throughout the camp. We also are very excited this year to implement a girls leadership program that will give local girls an opportunity to mentor camp participants, and look forward to providing an update on this endeavor in the weeks ahead of us. 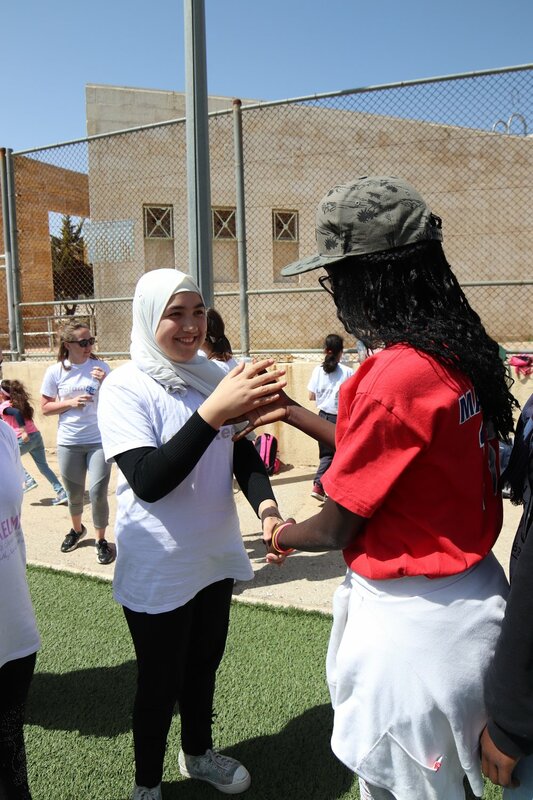 Establishing a running camp in Jordan as a way to empower girls was a vision that Nina put forth for her Fulbright proposal. So, while the Fulbright Team based in Amman has been busy planning this year’s camp, Nina has been on our minds. Through the camp, we hope to empower and uplift other women in hopes of making a lasting impact on the lives of young girls in Jordan. We are excited to announce the dates for the third annual Nina Brekelmans Running Camp for Girls and Nina Brekelmans Race for Girls in Amman, Jordan! 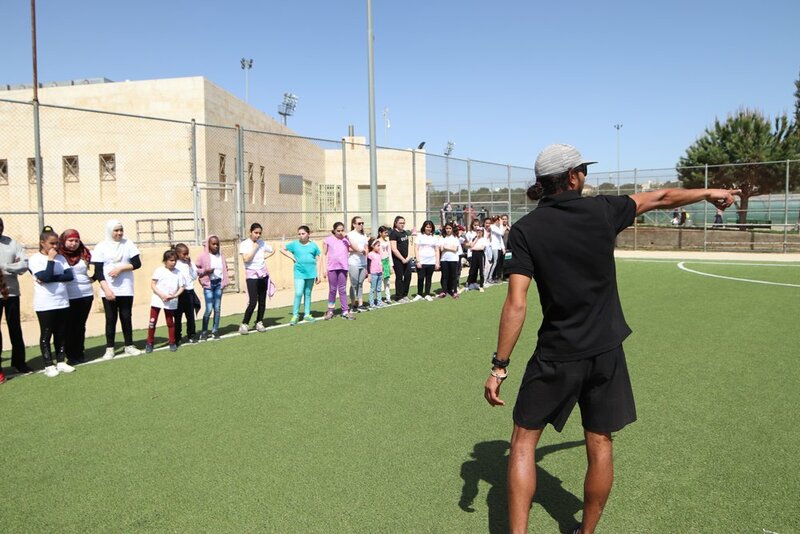 The camp will be held on four consecutive Saturdays - April 7, April 14, April 21 and April 28 - at Sports City, Amman's premier urban park and athletic facility. The culminating event - a 3k race - will be held the following weekend, May 5, at Sports City. 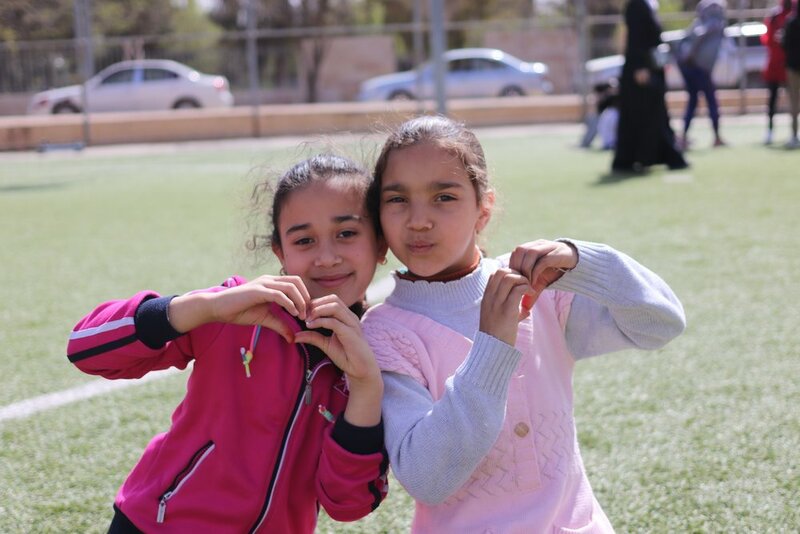 The camp and race continues to grow with the support of Nina’s family and friends, the U.S. Fulbright program, and our Jordanian friends and partners - including Sports City, Unlimited Distances, Boost, Reclaimed Childhood, Jordan Squash Federation and Ruwaad. Together we strive to advance Nina’s vision to promote self-confidence, leadership, and well-being among young women in Jordan through running. Camp participants can register here. If you would like to volunteer, you can register here. To follow along, sign up here for our mailing list. And if you’d like to help contribute to our growth, please consider donating. The Nina Brekelmans Memorial Foundation is a 501(c)3 non-profit based in Washington, DC. All donations are tax-deductible. Our last and final camp day started with the girls registering for the race next Saturday, April 22. Then, Coach Ibrahim led the girls in stretches. As the girls were in a circle around him, he introduced three camp guests. First, Ms. Tamara Armoush, a Jordanian mid- and long-distance runner who has broken three Jordanian running records and who was the first-place female competitor in the 10-kilometer race on Friday, April 14, as part of the Dead Sea Ultra Marathon. Second, Ms. Georgia Cottle, a runner from Scotland who was the first-place female competitor in the 21-kilometer race at the Dead Sea on Friday, and third, Ms. Hanoia Ali, a runner on Sudan’s national long distance team. She trains in Jordan and has won the Dead Sea Ultra Marathon several times. Hanoia was also one of Nina's closest friends and training partners in Jordan! Coach Ibrahim explained that girls are strong and highlighted these three guests as prominent examples and role models. To emphasize this point, he shouted several times “what are girls” to which the girls responded enthusiastically “STRONG! !” He then invited each of the guests to lead a few of their favorite pre-run warm-ups. Next, Coach Ibrahim led the girls and guests on a three-kilometer run that mirrored the race course for next Saturday. The girls did a good job of running, even after some of them had to take breaks to walk in between. Finally, they wrapped up the exercise portion of the day with sets of sprints. Coach Ibrahim broke the girls up into groups of four, which allowed many girls to boast afterward about coming in first or second place. The sprints always get the girls excited about running and competing! Our final lecture came from Ms. Farah Hashem, who is a Jordanian sprinter with the fastest time in Jordan for the 60-meter race. In addition, as part of a Jordanian team, she won third place in the 4x400-meter relay at the last West Asia Indoor Championship. She talked about being a female runner in Jordan and emphasized that being a good runner requires not just athletic training but also eating healthy and keeping up with your studies. She described her path to becoming a runner, starting as a soccer player, becoming part of a track team, and eventually winning a bronze medal at the West Asia Indoor Championship. She also highlighted the importance of her studies at the American University of Beirut, from which she graduated recently, while continuing to run seriously there. She concluded by answering the girls’ questions about her path and running. During the Q&A, she emphasized that she is as passionate about her studies as she is about running as well as how this has helped lead to her success. By the end, she had inspired the girls, their chaperones, and the other volunteers. Before lunch (once again generously donated by Siniora Food Industries), the girls watched a video put together by Nina Brekelmans Memorial Foundation President, Ms. Mary Grace Pellegrini. The video featured different U.S. university-level runners and coaches discussing why they love running, when they started running, as well as advice for competing in a race for the first time. The girls learned that it is important to enjoy running, something that comes more easily through the friendships formed with teammates, as well as to pace themselves while running—rather than start off sprinting, which is something the girls love to do! After lunch, Coach Ibrahim and the volunteers organized group pictures and a small ceremony to present each camper with a certificate of completion. The girls loved getting to come up, take a picture, and receive their certificate. They admired the high-quality printing and enjoyed shaking different guest and volunteer hands—especially those of Tamara, Georgia, and Hanoia, who participated in the camp all day. After getting psyched up about the race next week, the girls left smiling with extra sandwiches and their certificates in hand. Our third session started off at the same time as Jordan’s largest clean-up campaign, which targeted dozens of public sites across the country—including Sports City. Although Sports City was very crowded as the girls gathered, Coach Sweity and Coach Ibrahim organized the girls and took them on a 2K run. This run differed from previous weeks because the coaches instituted a no-stopping policy to help prepare them for the race in two weeks. This meant that the girls ran or walked the whole time without any pauses. After the run, the girls enjoyed a water break before moving on to stretches, led by Coach Sweity and Coach Ibrahim. Next, the girls moved inside to the Sports City Squash Federation’s classroom for a presentation on healthy eating by Dr. Dania Qaryouti. Dr. Dania joined again by popular demand from last year’s camp. She focused on helping the girls identify healthy meals. She also covered the benefits of healthy eating and signs of an unhealthy diet, including eating disorders. Her comprehensive presentation on consuming healthy meals included interactive activities. Specifically, she instructed each of the girls to write down what they had eaten for their past three meals, and then she invited them to present these descriptions—which the girls clamored to do! During the presentations, she asked all the girls to identify the food groups included in each meal as well as to highlight any foods that could have been added to make the meal healthier. Before concluding, she had the girls write down examples of healthy meals, helping to reinforce her lessons. With their appetites engaged, the girls then headed back outside for lunch (donated again by Siniora Food Industries). After enjoying lunch among the trees and sunlight in the recently cleaned Sports City, volunteer Kelly Connors led a quick running skills activity with the translation assistance of volunteer Abdelqayom Ahmad Mohammad Albasha. Kelly, who is preparing to run the Boston Marathon for the second time, gave the girls advice about how to run more efficiently, using the correct breathing techniques and running form. She then told them about the benefits of envisioning yourself finishing a race, and she had each girl draw herself crossing the finish line at the Nina Brekelmans 4K race in two weeks. Before wrapping up the day, the girls excitedly shared some of their pictures and thoughts about running the race. 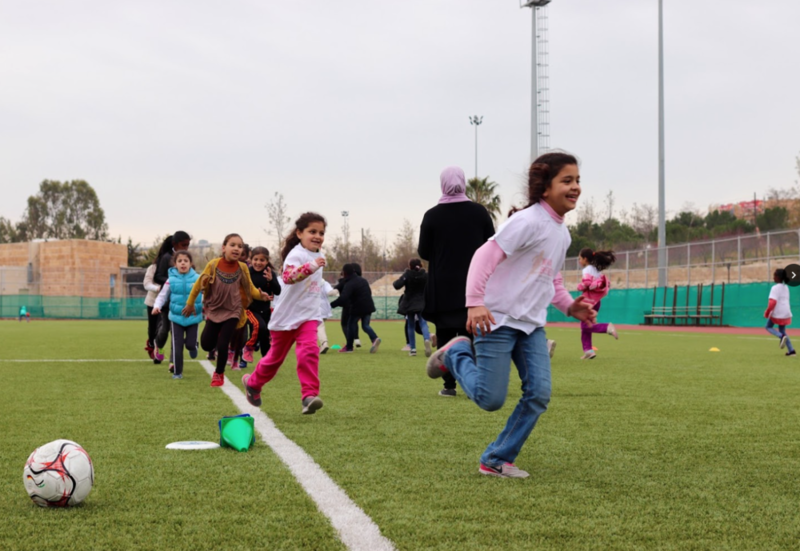 With the second annual Nina Brekelmans Running Camp for Girls now in full swing, we want to introduce a few of the people in Amman who make it possible: Coaches Mohammad Al-Sweity, Batoul Arnaout, and Ibrahim Abu Asbeh. Each of them knew Nina personally, and they have committed their time and energy to help the Foundation fulfill Nina’s mission of expanding opportunities for women in Jordan’s running community. Their combined experience as competitive athletes, coaches, and community leaders proved invaluable for our success in 2016, and we are thankful to partner with them again in 2017. Mohammad Al-Sweity has been instrumental to building the camp. As our head coach, Mohammad Sweity plans the weekly training sessions and leads the girls through workouts. He shares instruction on proper running form, stretches, warm-ups, and cool-downs and gives the girls insights into the art of racing. Last year, Coach Sweity gave a poignant presentation on the spirit of running and racing, during which he shared stories about Nina and her time as an athlete in Jordan. When Nina was drafting her Fulbright proposal, she specifically cited Coach Sweity as partner to engage for her research, so we are so thankful to have him on board. 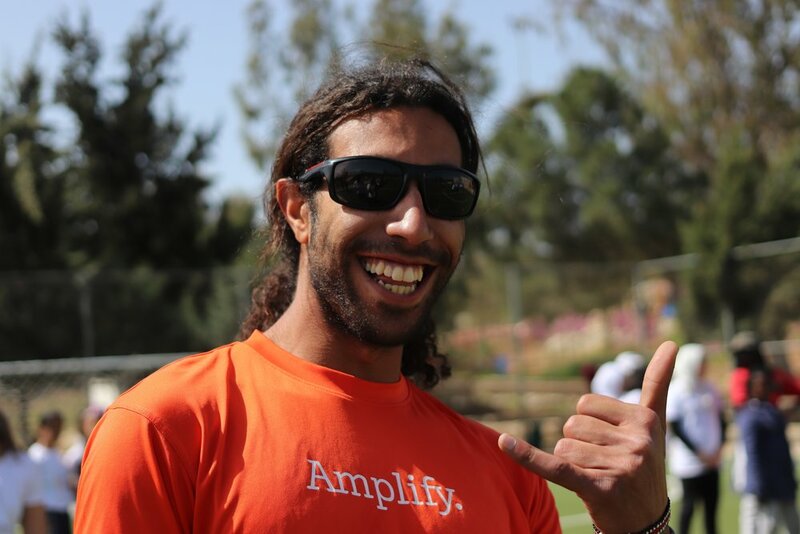 In his free time, Coach Sweity is an esteemed ultra-distance runner in Jordan. Batoul Arnaout also joined us during the inaugural year and assisted with workouts, group activities, and event planning. 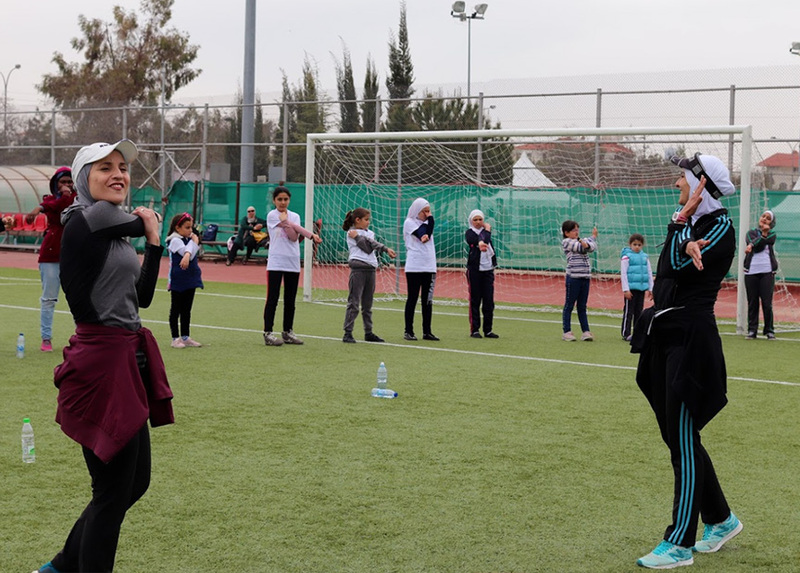 As both a competitive athlete and the founder of a local organization that promotes sports in society, BOOST: Better Opportunities and Options for Sports Today, Coach Batoul is well-versed in overcoming the challenges that face young women in pursuing athletics in Jordan. This year, she talked with the girls about how running improves self-esteem, promotes a positive body image, and fosters strong and healthy relationships within the community. Batoul is an amazing and inspirational athlete, and we're similarly thrilled to have her support. Last but not least, Ibrahim Abu Asbeh has worked closely with us since the beginning to transform our idea of a camp for girls into a reality. 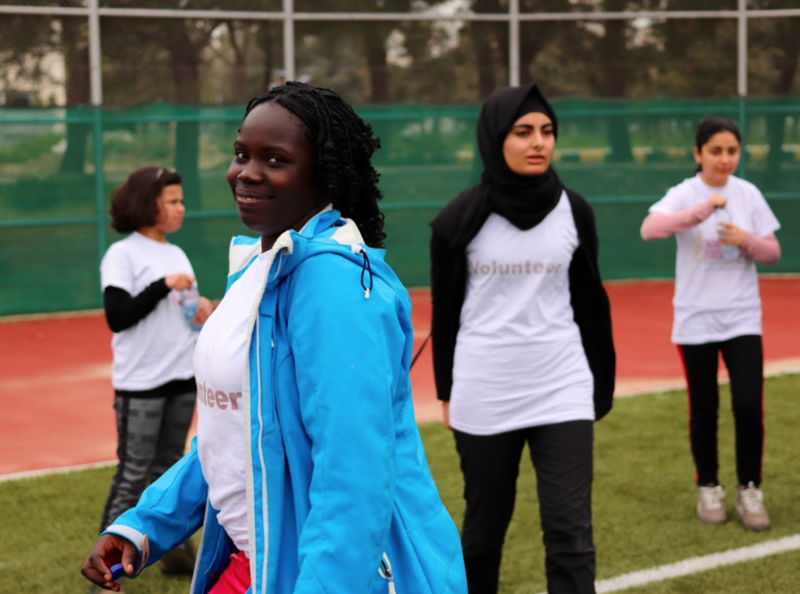 Coach Ibrahim was the catalyst for meetings between our Fulbright team and the leadership at Sports City, which helped us secure access to facilities for the athletes, obtain a sponsorship for lunches during the camp, and gain access to the Sports City running trails to host the race. In addition to helping us with the camp logistics, he also coaches the athletes during each of the practices. In 2016, Coach Ibrahim surprised us all by initiating a series of relay races that ended up being one of the most fun and memorable episodes from camp. He has poignantly spoken about his friendship with Nina at the camp, and we're so grateful to have his involvement. In addition to being a runner in his own right, Coach Ibrahim is also the General Secretary of the Jordanian Athletics Federation. Many thanks to Coaches Sweity, Batoul, and Ibrahim for the time and effort they are dedicating to the camp and race! On the first day of camp, the girls learned about Nina’s legacy and did their first run together—one loop at the Sports City complex, which is exactly 1.8 kilometers (or a little over a mile). After the run, they took a water break before getting into groups and doing sprints for about 20 minutes. The girls seemed to really enjoy the sprints because of the short distance and thrill of competing with each other! Then they shifted into the first guest speaker presentation from Jasmine Kadoura, with assistance from her friend, Farah Shouani. The presentation focused on strength training as well as its importance for runners and involved four different exercises for the girls to try in groups of 10 to 15. These exercises included duck walks, using resistance bands, and doing ladder exercises. Jasmine concluded her presentation with a full-group exercise, where girls tried to catch a soccer ball so they could pick an exercise for the group to do (e.g., lunges, squats, push-ups, or burpees—which are a more elaborate form of a push-up). The girls seemed to really enjoy this game, as they tried to elbow each other out of the way so they could catch the ball, and then the girls waited in anticipation to see if the ball-catcher would pick a relatively hard or easy exercise. We wrapped up the day by eating lunch (donated by Siniora Food Industries) as well as distributing introductory surveys for the girls to fill out about their views on running and healthy lifestyles. Overall, the girls seemed happy and excited to be out and about at Sport City on a nice day! The camp leadership team meets in Amman at Sport City to plan for this year's events. (L to R: Bishr Khasawneh, Lilly Frost, Lena Hamvas, Matthew Liston, Ibrahim Abu Asbeh, Batoul Arnaout, and Mohammad Al-Sweity). Lena Hamvas is part of this year's leadership team and teaches English in Irbid, Jordan, as a 2016-2017 Fulbright scholar. Nina Brekelmans had a mission to improve running infrastructure for girls in Jordan and encourage healthy lifestyles through running, a mission we are determined to follow. There is a group of girls in Irbid, Jordan (1.5 hours north of Amman) who are taking English classes and heard about the running camp. From these girls, 9 of 10 girls showed interest in running in the Nina Brekelmans Running Camp. 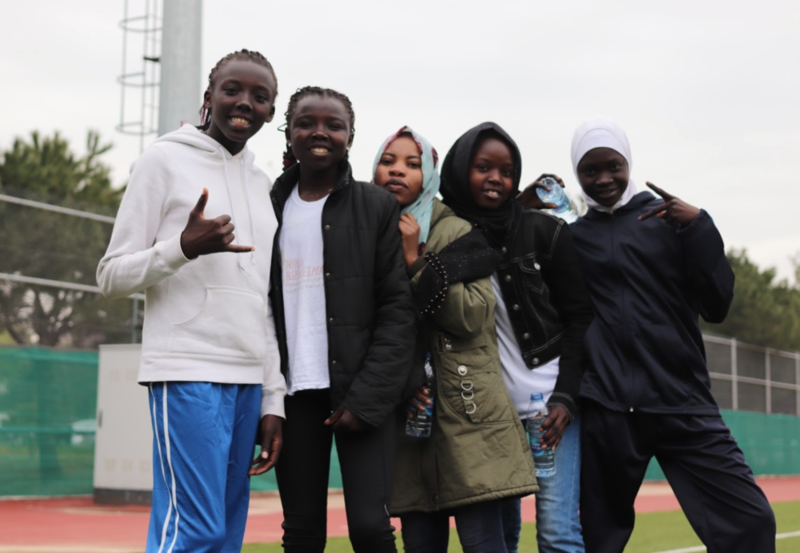 However, since they are far away from Amman and are not able to come to the camp each week, they have committed to practicing once a week in Irbid as a group with plans to join the girls in Amman for the race. The local community is very excited about the running camp, and we are very excited to help build the infrastructure to make it all happen! The Nina Brekelmans Running Camp for Girls will have girls from many different neighborhoods. The girls range in age from 8-14 years old. A group of dedicated volunteers from the community at-large will help make the camp happen. The volunteers will be helping the girls with running practice and understanding the lessons given by guest speakers. We will have guest speakers who will speak about healthy lifestyles and about sports in the community and around the world. This year, the girls will have the chance to interact with runners from the United States who knew Nina Brekelmans. This is a good opportunity to exchange cultures through the love of sports. After four weeks of camp, the girls will run in a race on April 22. This will give them a chance to use what they practiced during the camp and run in a real race. The camp and race will give the girls a chance to meet people in their communities who like to run and do sports. After the camp ends, we hope the girls will be inspired to continue doing sports in their community throughout the rest of the year. Now Available - Nina Brekelmans Patches! We are little more than three weeks away from kicking off the 2nd annual Nina Brekelmans Running Camp for Girls on March 25, and cannot wait to welcome this year’s runners to camp! We are on track to achieve our goal of doubling the size of the camp. The Fulbright team is recruiting volunteers, and we’re putting together a great lineup of speakers, potentially even including Olympic runners (more on that to come!). Our coaches and host, Sports City, are preparing for another great camp, as are our many Jordanian friends and sponsors. We also felt now was the perfect time for our supporters to join us keeping Nina’s spirit in our minds and hearts. We just received a new order of the popular patches that were created for that very purpose. Nina’s friends and family frequently wear these patches while running or doing other activities in her memory. And if you already have one, consider buying one for someone else! 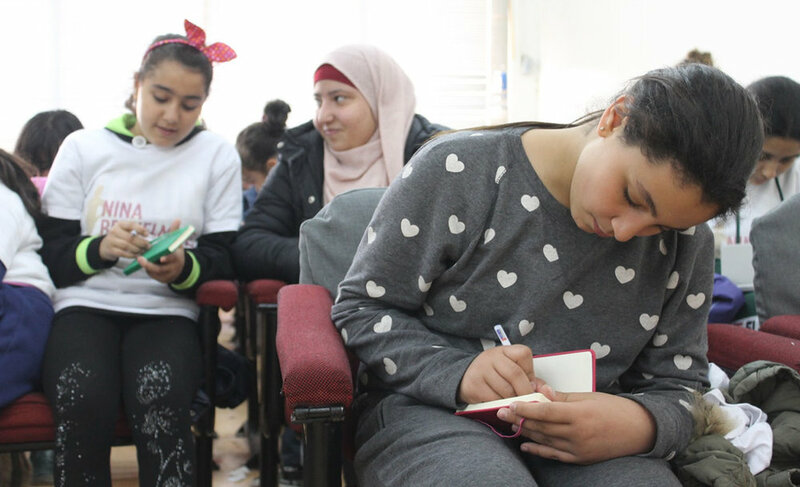 We think this is a powerful way to promote Nina’s vision to empower young women in Jordan. Plus, you can help us meet our goal to raise $1,500 to ensure our team has supplemental resources to provide our camp-goers and race participants with an exceptional experience. These funds will be used to defray camp costs for transportation and snacks as well as t-shirts, race bibs, and medals. Buy one, or buy a bunch! You can get one for $12, 3 for $35, or 5 for $50. All proceeds from the patches directly support the camp and race. We are excited to announce the dates for the 2nd annual Nina Brekelmans Running Camp for Girls and Nina Brekelmans Race for Girls in Amman, Jordan! 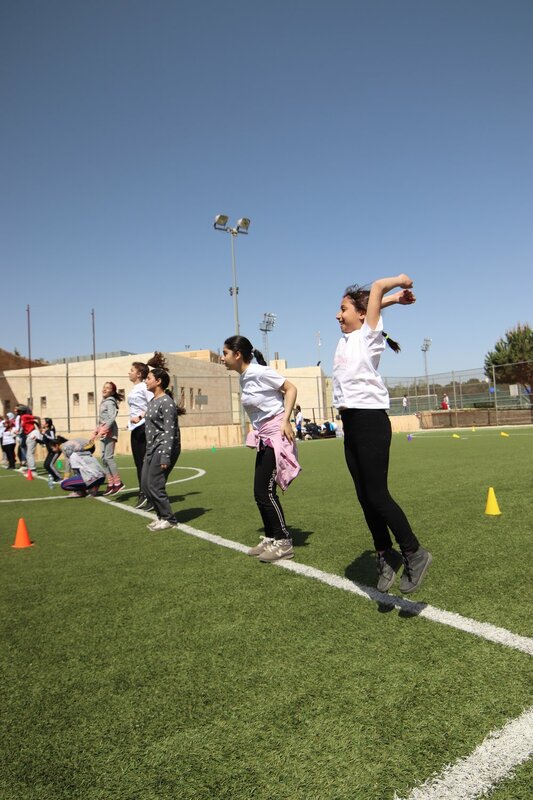 The camp will be held on four consecutive Saturdays - March 25, April 1, April 8 and April 15 - at Sports City, the area’s premier urban park and athletic facility in Amman. The culminating event - a 3k race - will be held the following weekend at Sports City. The camp and race were successfully piloted last spring with the support of Nina’s family and friends and the U.S. Fulbright program. Together, we commemorated her vision to promote self-confidence, leadership, and well-being among young women in Jordan through running. When the camp started, more than half of the girls had never run 3k. Week by week, the girls learned more about running techniques and training, heard from guest speakers, and bonded over lunch and team activities. In the end, the girls even made history! 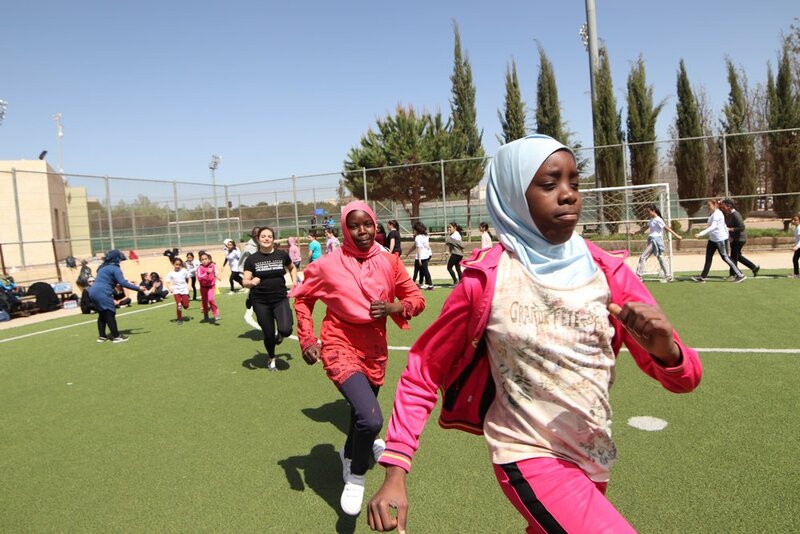 With widespread participation from across Jordan, more than 70 girls completed the capstone event: a 3k race through Sports City’s pathways that also happened to be the first girls-only footrace in Jordan. We are proud to again work with our Jordanian friends and sponsors to carry out this vision. In particular, we’re thankful for our coaches, Mohammad Sweity and Ibrahim Abu Asbeh. And once again, we have a fantastic leadership team of U.S. Fulbright students - Matthew Liston, Lena Hamvas, and Lilly Frost - to help lead planning and logistics and to build upon last year’s success. Expansion: The initial camp was strategically small in size to provide an attentive, high-quality experience for all runners. This year we aim to double the size of the camp from nearly 25 girls to 50, while retaining a quality and supportive experience for all. New connections: We are piloting a video blogging exchange to connect our young female runners with other female athletes in the US and around the world. 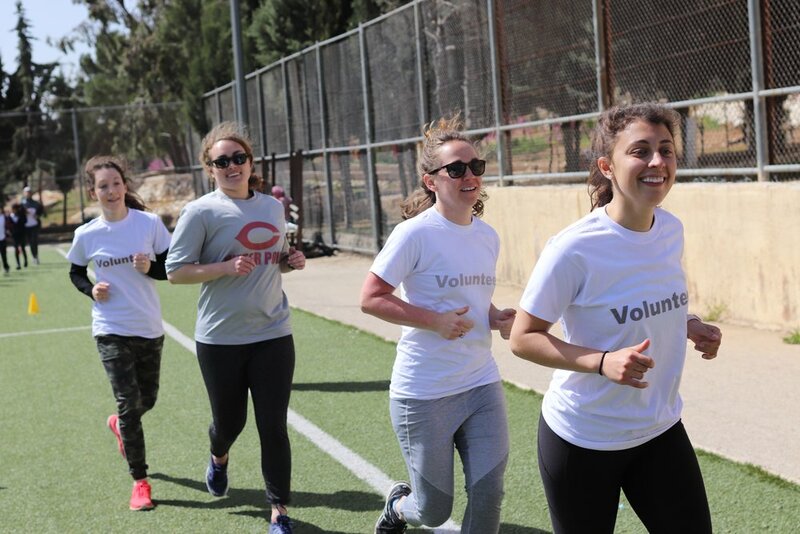 Fundraising: We are seeking $3,000 in grant funding from the U.S. State Department to cover transportation, food, and material costs for additional runners, and to expand outreach efforts throughout the Amman community. This will help us as we look to accommodate a greater number of girls from a cross-section of Jordanian society, including the refugee community. Organizers are also seeking additional donations from other foundations and private sources. In the weeks ahead, we’ll provide more details about camp programming and the race. To follow along, sign up here for our mailing list. If you’d like to help contribute to our growth, please consider donating. The Nina Brekelmans Memorial Foundation is a 501(c)3 non-profit based in Washington, DC. All donations are tax-deductible.